This gem of a recipe comes from one of my favorite bread books, which I reviewed in a not too distant past: How to Make Bread. Such a simple and straightforward title, but it says all that matters. You will learn how to make great bread following the careful instructions of Emmanuel Hadjiandreou. 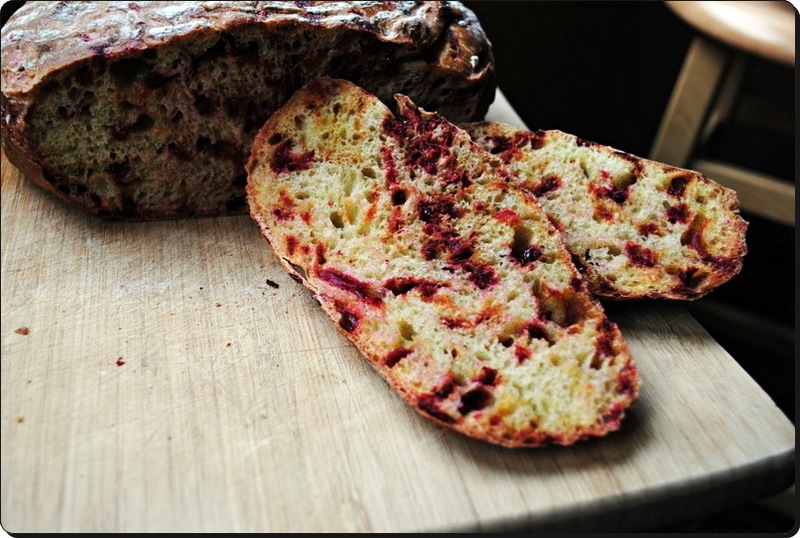 This bread is perfect for the holiday season, its crumb decorated with intensely red dots of beets, that are coarsely grated and incorporated raw in the dough. You may wonder if the bread turns out too sweet or with a strong flavor of beets? Not really. It is a sourdough still, but with a background of sweetness that is just enough to surprise your palate and act as the perfect supporting actor for a slice of Roquefort cheese. Sharp cheeses, eggplant relishes, anything with a nice bite and some saltiness will go extremely well with this bread. I happen to like it all by itself, slightly toasted. For this large boule I used two beets, one medium, one small. One of the things I loved about this dough was the change in color as the dough proofed, starting with a gorgeous, intense purple, and getting more and more subtle as the fermentation went on. 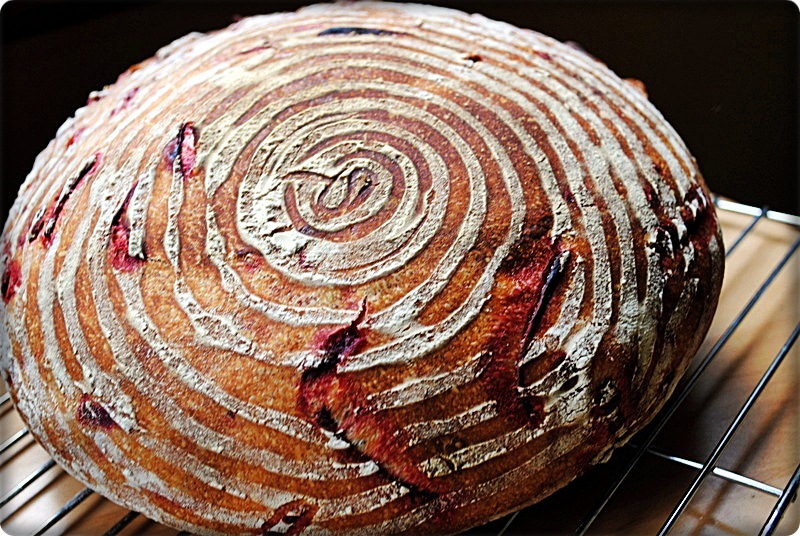 The recipe for beetroot sourdough is very similar to the one I published with Emmanuel’s permission last May, except for the inclusion of grated, raw beets in the dough. But a more detailed step by step photos of the full process of making this bread can be found with a quick jump to Garlic Buddha blog, a nice virtual spot! Sally! I think of all the gorgeous loaves I’ve explored on your site, this one hits me as the most inventive and beautiful… not only for the stunning beet (what a success!) but also the cover design… so, so, great! I can just imagine a warm slice of this beaut with a sharp blue cheese melting at its mercy… oh my goodness, I’m suddenly starving!! Gem indeed. A jewel bread… Stunning crumb and gorgeous pattern. And the suggested pairings sound perfect… Wow! Wow! What an idea Sally. Perfect color for the holiday! I thought so too… the red dots all over the bread made it the perfect choice for the holidays. Phil already wants me to bake another loaf, this one is a goner! I’m intrigued that the color began pink and then changed.. that’s an interesting scientific sort of question for me:) Love this loaf.. and I’m imagining a slice with some roquefort this evening.. with a glass of red wine..
Roquefort and Gorgonzola were the best pairings, in my opinion. Manchego was not bad either… 🙂 I love cheese! Absolutely beautiful bread. I love this recipe. Men just do not seem to like beets as much as women. Some men do but my hubs hates beets. Interesting, I never thought about it in those terms, but I think it’s true – most of my women friends like beets and refer to the fact that their partners twist the nose at them… go figure! Must be in the Y chromosome! I’m amazed that you can get such a colourful looking cake with the humble beetroot. I still can’t even imagine what the taste would be like even though you said it’s still reminiscent of regular sourdough bread. A very unusual bread, but now I must make his chocolate sourdough and see how we like it…. Sally, how beautiful!! I love the swirls on top especially! 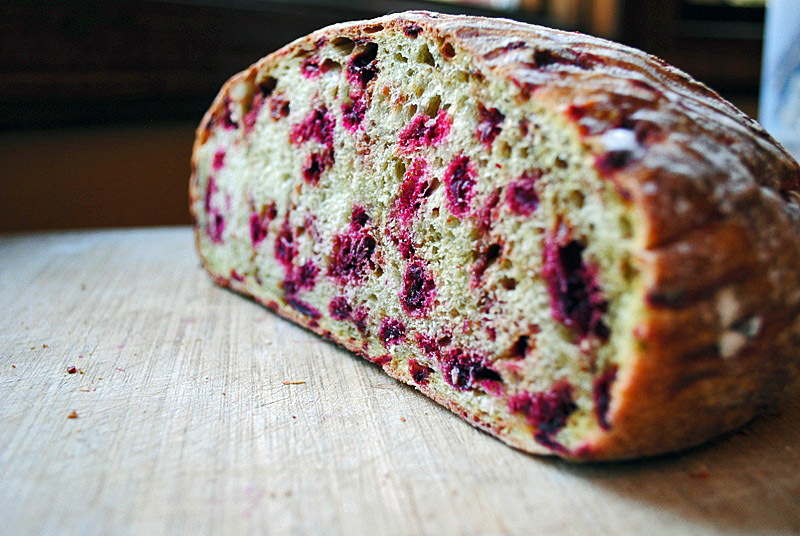 I think a sweet beetroot is a must here – looking forward to your thoughts on this bread! I love the purple studded throughout the bread. I’m SO not into beets but this looks so festive I”m going to have to try it! Just remember to pair it with sharp cheeses and you will enjoy it! oh it looks hearty and delicious. I love the flavors you chose for it and the pattern on top and around is just beautiful! I am crazy over breads and have made many, but have never seen this idea! Beautiful, brilliant and I can imagine how the minerally earthy flavour of the beet pairs with the sour dough! YUM! Stunning bread! The change in color is fascinating. Heading out to pick up beets now. Thanks for the mention. I do like this bread and post about it again in August. However, people may be disappointed if directed to my blog as I have not given a recipe as I respect Hadjiandreou’s copyright. So I would suggest people add a handful of grated beet root to their favourite white sourdough or, better still, buy this wonderful book! 🙂 have you tried many of the other sourdough recipes? The chocolate sourdough is really unusual. But the cheese, chilli and coriander leaf is divine. My wife likes her chillis so I used extra fresh green chillis – lovely! I do not live far from the School of Artisan cooking where Emmanuel works so one day I hope to do one of his courses. Sally, this bread is so beautiful! I love the flecks of beet in the crumb, and that pre-fermented purple dough is so gorgeous! I’ve never really eaten beets before (although I did put them in a chocolate cake once…). Very nice loaf! I love the beet specks in the sliced bread!